One of the little-known time-saving features of Mac OS X is services—hidden, single-feature commands that you can access from a special Services menu, or, sometimes, from a contextual menu. These features are generally provided by applications—built-in OS X applications or third-party programs—and let you quickly preform actions that usually require launching additional programs and taking many steps. Here are answers to frequently asked questions about how to find, use, and manage services. A: Simply put, OS X services let you borrow features from other programs. So, as I write this article in Bare Bones Software’s BBEdit, I can select some text, select the Services menu (found in ApplicationName -> Services, in this case, BBEdit -> Services), and then choose New Email With Selection. A new message window opens in Apple’s Mail, filled with my text selection, that I can easily address and send to my editor. Services are grouped in categories, and have application icons next to them. They're found in the Services submenu of the menu named after the application. For example, BBEdit -> Services. As this screenshot shows, the Services menu allows me to do many things with selected text—all without leaving BBEdit. I can search in Dictionary, Google or Spotlight; I can add the text to Literature and Latte’s Scrivener, make a new sticky note, or a new note in Bare Bones Software’s Yojimbo; or I can send the text to Mail to make a note or an email. What you see in your Services menu will depend on which applications you have installed on your Mac. Q: Can I right-click to use services? A: You don’t always have to use the Services menu to access services. Right-click, or Control-click, on selected text in a document, and you’ll see either a Services menu near the bottom of the contextual menu, or simply a list of services (this depends on the application). You’ll see only some services there; not as many as in the menu bar Services menu. So unless you are sure the service you want is in the contextual menu, you’re better off using the menubar menu. Q: Where’d all my services go? I don’t see anything in the Services menu. A: If you don’t select anything before you access the Services menu, you might find the menu is empty or has very few options. This is because services are contextual; what you see depends on what’s selected. With nothing selected in TextEdit and Pages, for example, I see only the option to take a screenshot or import an image. In general, services function when you select content. This can be text or graphics in an application, or even files in the Finder. Also, some applications don’t support services: this is the case for Microsoft Office 2008; Office 2011 does support them, though. Q: My Services menu is out of control. Can I cut down the number of things I see there? A: If you have a lot of applications, you may have a lot of services. In fact, there may be too many to make using the Services menu practical. Fortunately, in OS X Lion, you can choose which ones are visible. Go to System Preferences, click on the Keyboard pane, and select the Keyboard Shortcuts tab. Click on Services to see a list of all the services on your Mac. Here, you can check or uncheck the ones you use most or not at all. Note that just because you check one doesn’t mean it will display all the time; remember, services only display when they’re relevant to the type of content you’ve selected. The Keyboard preferences let you access services, and choose which ones display in the Services menu. Services are grouped here by category—Pictures, Internet, Files & Folders, and so on—but they don’t display with application icons, so it may be hard to see exactly which program they belong to. If you get confused, check the Services menu (which does display program icons) to figure out what application a specific service is for, so you can better decide what to check or uncheck. Q: Where are services installed? A: Services can be installed in three places. First, they can be inside applications. Second, applications can install them in the /Nameofstartupdisk/Library/Services folder. Finally, some applications install them in the Library/Services folder in your user folder. Some of these may be .service files, but others may be automator actions, with a .workflow extension. Q: Is there any easier way to get to the services I want to use the most? A: Using the Services menu can be annoying because you have to click on the application menu, then the Services submenu, and then choose the service you want to use. (As I mentioned before, many services don’t show up in the contextual menu.) If you plan to use a specific service regularly, making a keyboard shortcut for it will save you time. 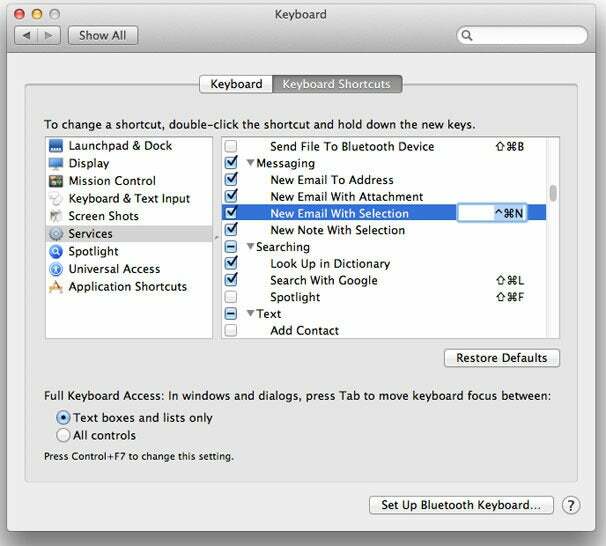 To do this, open the Keyboard pane in System Preferences, click on the Keyboard Shortcuts tab, and then in Services. Find the service you want to access with a shortcut, and then double-click to the right of it. 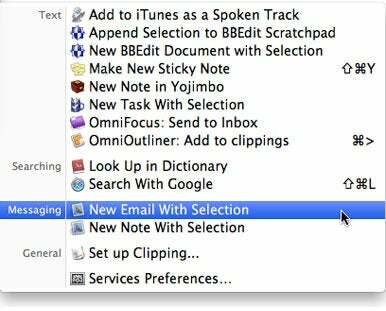 Get quick access to a service by creating a keyboard shortcut for it. Enter the keyboard shortcut you want in this pane, making sure it isn't used by another application. Using the Control key (^) in the shortcut generally ensures that other programs don't use it. After you’ve set the shortcut and pressed return, the service will become unchecked. Select it again to ensure it shows up in the Services menu. If you forget the shortcuts you have applied to services, look in the menu to jog your memory—they’ll be displayed to the right of the service’s name. Q: Can I download more services? A: Yes, you can. I’ll discuss third-party services (ones not included with applications) in another article this week, as well as how you can make your own services. In the meantime, please tell us about your favorites in the comments. Senior contributor Kirk McElhearn writes about more than just Macs on his blog Kirkville. Twitter: @mcelhearn Kirk is the author of Take Control of Scrivener 2.